* Charge-by-phone purchases were discontinued as of Tuesday, April 2, 2019. If you have any questions or need help when purchasing tickets online – please call Ticketmaster’s Fan Support Line: 800-877-7575. Ticketmaster Fan Support can also be reached via email here. Or you can live chat, which is available 24 hours a day. Sign into your Ticketmaster account. If you have an order under ‘order details’, simply click on the “Live Chat” button on the bottom right of your screen. Customers with invalid tickets are welcome to purchase valid tickets at BOK Center Box Office – seating location and price based upon availability. * Charge-by-phone purchases were discontinued as of Tuesday, April 2, 2019. Located at the corner of 3rd St. and Frisco Ave. Hours are 10:00AM to 5:00PM, Monday through Friday. Evening, weekend and holiday hours vary according to event schedules. The box office accepts cash, Visa, MasterCard, American Express and Discover cards. Directions indicated are to the nearest intersection of BOK Center, which is 3rd Street and Denver Avenue. Parking opportunities are available at private parking facilities located throughout Downtown. BOK Center does not own or operate any parking areas. There are over 9,000 available parking spots within a ten-minute walk of the arena. All privately-owned lots determine the rate for parking. After 5pm all on-street metered parking is free. 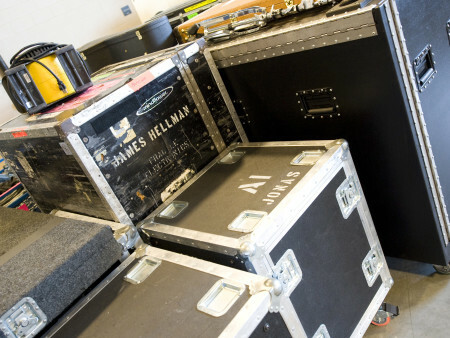 You can get the arena experience when you stop by Backstage. Whether you want a full meal or just something to snack on, you’ll find it here with items like stuffed pretzels, hot dogs and popcorn. Do you want melty, cheesetastic, cruncherific goodness? 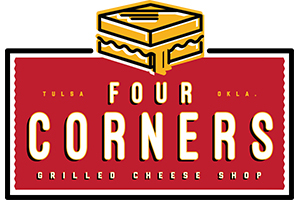 We have you covered with the brand new Four Corners Grilled Cheese Shop where you are able to choose from a variety of delicious grilled cheese options. Fulfill that sweet tooth of yours and stop by the Candy Shop! Choose between different types of gourmet or boxed candy. If you’re looking for popcorn, Doc Popcorn can’t be beat. Choose from delicious flavors such as Hoppin’ Jalapeno, Sweet Butter, Cheesy Cheddar & Butter Butter. Frank’s Gourmet Dogs has every type of dog you can imagine! Whether you’re craving a simple hot dog or a juicy bratwurst with homemade chili and cheese, Frank’s Gourmet Dogs has you covered. Need a snack to hold you over? 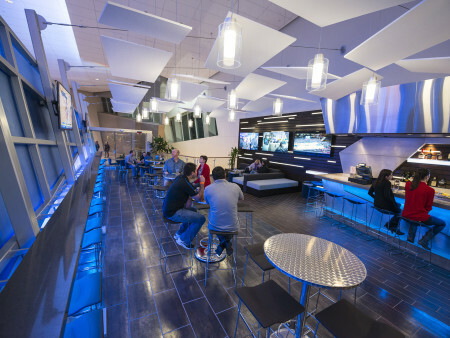 Stop by the Fuel Filling Station and choose from options like hot dogs, pretzels, baked potatoes or popcorn. Be sure to grab an ice cold beer or soda to wash it down. In the mood for some spicy hot wings, a chicken sandwich or maybe a veggie burger? Roadie’s Grill has what you’re looking for! Looking for some fresh authentic Mexican food? 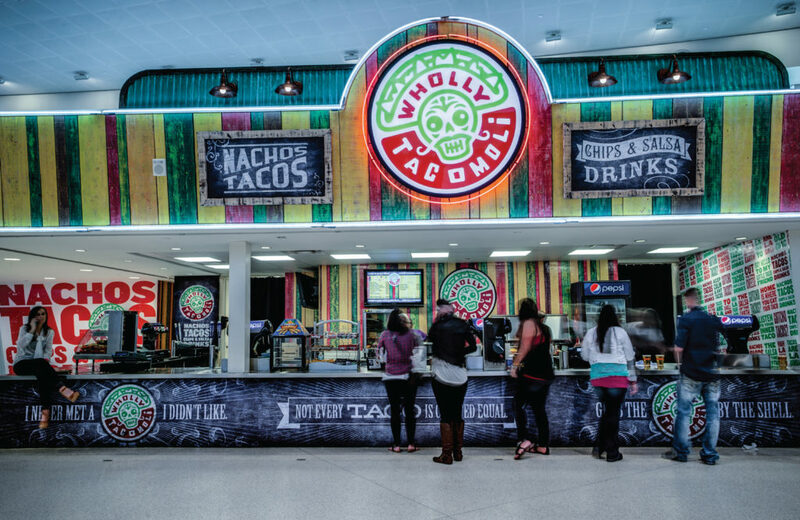 Stop by Wholly Tacomoli for some nachos, tacos, taco-ritas or just grab some chips and salsa on the go. Enjoy the most popular items on the menu such as Theta Burgers, Onion Rings, Chicken Strip Baskets or Frozen Pink Lemonade. Poutine is a Canadian dish of French fries topped with fresh cheese and sauce. If that sounds like something up your alley, come see us outside section 314! We would love your feedback! Please take a quick survey here about your most recent experience at our concession stands and receive a free regular fountain drink on us upon completion. We appreciate any feedback you have! Check out the BOK Center ! Looking for a great fundraiser for your non-profit organization, church or school? 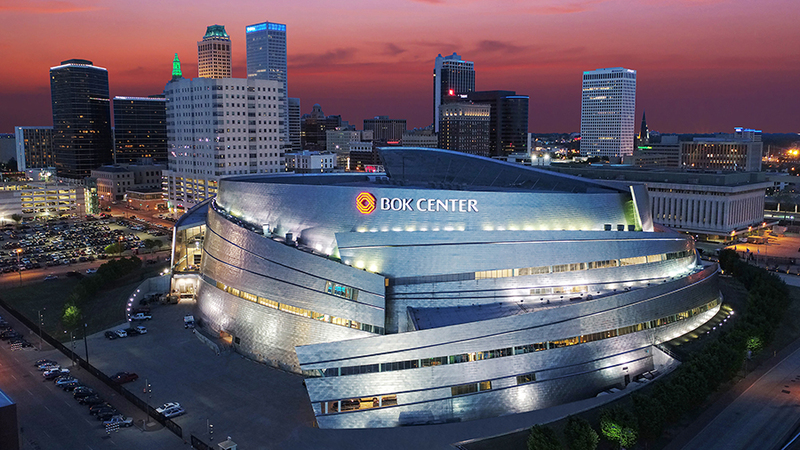 Non-profit organizations can staff concession areas at BOK Center for fundraising opportunities. The requirements are simple and the commitment is worthwhile! Non-profit organizations wishing to participate in this program should download the application here and once completed, send it to bok-savor@smgtulsa.com.